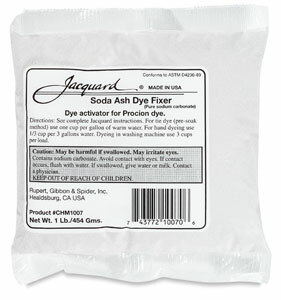 Jacquard Soda ash is pure sodium carbonate, perfect for setting Procion dyes. Included in Jacquard brand tie-dye kits. Soda ash is a mild alkali that promotes the chemical reaction between Procion MX fiber reactive dye and cellulose fiber. Soda ash is also known as sodium carbonate, washing soda, or sal soda. One pound of soda ash is required to activate and "set" Procion dye for approximately 15 T-shirts. What is soda ash, and what's it for in dyeing? Soda ash is the active ingredient in washing soda. The chemical name for it is sodium carbonate, chemical formula Na2CO3. It is more basic, that is, less acidic, than sodium bicarbonate (baking soda), whose chemical formula is NaHCO3. 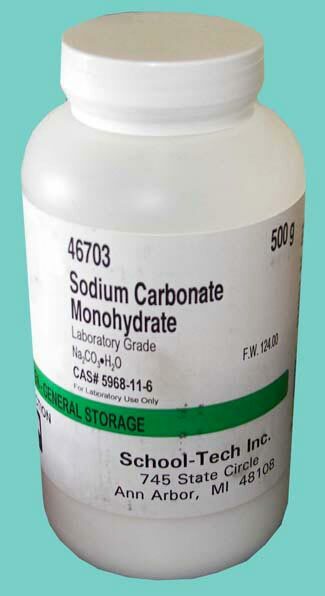 The purpose of sodium carbonate is simply to increase pH. Some forms of soda ash (e.g. that labeled as 'washing soda') contain more water molecules than others, which makes them weigh more and be larger for a given number of sodium carbonate molecules - this means that you need to measure out a larger quantity of the hydrated form in order to get the same results. If you buy sodium carbonate without the extra water molecules, then store it for several years in humid conditions, it will absorb some water and appear to lose strength, when in fact it has merely 'bulked up' and needs to be used in larger volumes. Where can you buy soda ash? Although you can buy washing soda in the grocery store, this is usually advised against, because some US brands in the past were known to contain optical brighteners, salt, and/or fragrances. However, Arm & Hammer brand "Super Washing Soda" does not now contain any additives, though you must use a larger quantrity due to its greater hydration level (see above). A better source is a swimming pool supplies store, or a hardware store that carries some pool supplies, which will carry pure sodium carbonate (a popular brand is pH Up), sold for the purpose of increasing the pH of pool water. This is typically cheaper than mail-ordering from a dye supplier, and just as good. Beware of suppliers that try to sell you sodium bicarbonate instead of sodium carbonate; bicarbonate is much less basic (it has a lower pH), and will not work for most dyeing recipes. What is soda ash used for? Do we need to use soda ash with Rit dye? No, soda ash will not make all purpose dye, such as Rit® or Tintex®, permanent on the fabric. Instead, you must either use a washfast dye such as Procion MX dye, which does require soda ash, or use a commercial cationic fixative in order to make all-purpose dye acceptably washfast, so it does not bleed in the laundry forever. How do you use soda ash with Procion MX and similar fiber reactive dyes? There are three choices, depending on what you're doing: add the soda ash before the dye, add it with the dye, or add it afterwards. Adding the soda ash after the dye is the usual method for immersion dyeing and low water immersion dyeing. Is there any alternative for soda ash? Sodium silicate. Fabric that has been painted with Procion MX or similar dyes, and the dye allowed to dry, can be treated with a liquid sodium silicate solution, also known as water glass. This product is sold under the name of PRO Fix LHF and PRO QuickFix by PRO Chemical & Dye, as Drimafix by Batik Oetoro, as Tobafix by Tobasign Dyes, and as AfterFix by Dharma Trading Company. Sodium silicate will substitute nicely for the soda ash step above. (See Sources of Supplies page for contact information.) AfterFix is a solution of sodium silicate. One possible drawback is that acidic solutions can turn sodium silicate into a gel that is extremely difficult to remove, so be sure to rinse well with alkaline or neutral water if at any step you introduce a low pH. Sodium bicarbonate. Baking soda, or sodium bicarbonate, decomposes at sufficiently high temperatures to form sodium carbonate, so it is an ideal substitute for dyes that will be fixed by extensive steaming or baking. It should not be used for room-temperature dyeing. Sodium bicarbonate at room temperature will produce a pH of only around 8, too low for ideal use on cotton and other cellulose fibers, though it is capable of producing some reaction. Acetic acid or citric acid. Protein fibers such as wool and silk can also be dyed at low pHs, substituting white vinegar (and heat!) for the soda ash. (Wool is damaged by high pHs such as we use for dyeing cellulose.) Do not try low pH (acidic) reactions with cellulose fibers, as they simply do not work.